Immediate priorities were to sleep, unpack, run a few errands, enjoy a gorgeous Ski Sunday with friends and now it’s time to cook an inaugural meal in the tiny kitchen. 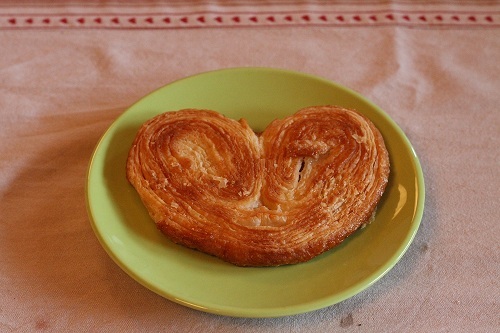 There is lots to sort out and lots to adjust to, including the light levels in the apartment and my oh so rusty French. A few weeks ago I asked fellow bloggers to suggest a favourite recipe I could recreate in our mountain hideaway – WordPress Recipe Challenge, and what better way to start than with a classic Tartiflette. With A Glass suggested it, so 3 cheers! And as she says ” Drinking wine is almost obligatory here! It makes the dish feel lighter (I am not joking! ).” I am taking this advice to heart, besides we needed to open a bottle for the recipe. So Cheers! With A Glass writes about the history of Tartiflette or rather it’s non-history, but whatever the origins it’s perfect for snowy days and has the staples of potatoes, onions, cheese and lardon (Bacon pieces) for Alpine cookery. I’m going to make a vegetarian version with mushrooms, see I’m already going off-piste! I’ve copied the recipe, but as we don’t have any kitchen scales or measuring jugs at the moment my attempt at making this was done by eye. If you can’t get hold of Reblechon, then find a good strong preferably stinky cheese! Cook the potatoes, let them cool down a bit, peel them and slice them thinly. Previous Post Previous post: Tick List ~ Check! I am soooo going to try this recipe, possibly with a bit of diced smoked ham. This is a bit like scalloped potatoes, eh? Claire, I’m thrilled to learn that you liked tartiflette. Your vegetarian version looks as luscious as any traditional one with bacon. Congratulations! I am happy you have appreciated the wine’s lightening effect 😉 Thank you so much for testing my recipe and for the link to my blog. It’s always extremely rewarding when someone appreciates my recipe. Ah! So glad you made it safe and sound! 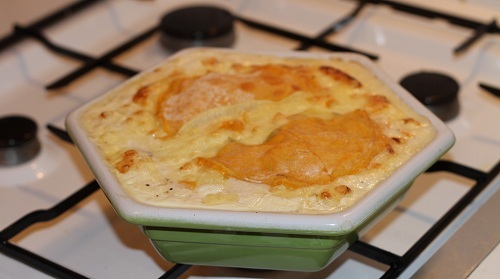 That tartiflette looks like one cheesy dish of goodness! YUM! YUM is the mote juste ! Hi C, we don’t have a fire (sadly) but I’m pleased you picked up on the stacking, so much neater than our own at home. It’s a shame is such a poor photo, the light levels yesterday were really grim, something I’m going to have to practice at. What a wonderful cabin in the snow. Skiing, cooking, staying inside cozy with good food…Nice! Thank you Teresa, hopefully we’ll have a great winter with lots of snow and cooking ! I’ll bet the tartiflette was super! Have fun! You know the best bit was the rind, it made the dish. 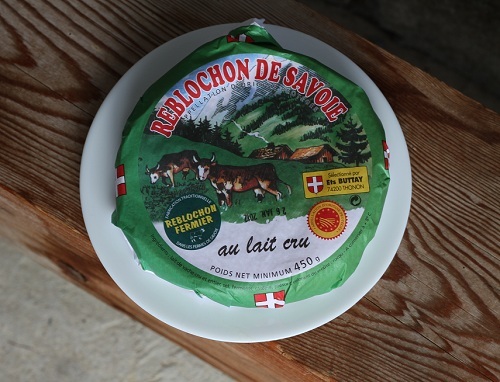 I know that I would love both yours and Sissi’s version as reblochon cheese is one of my favorite cheeses. The stickier the better when it comes to great cheese. Enjoy your skiing. Thank you Karen, I plan to make a meaty one later on in the season, it’s the kind of dish that once eaten you need to ski even more to burn off those calories! Bravo, so glad you’re settling in! Your first post has already evoked a warm and cozy retreat from your beautiful snowy surroundings. You’ve made my day 🙂 Thank you! Can’t wait to see more photos from your temporary home! Sob, sob, sob and boo hiss to customs!! How comforting and warming this dish looks! 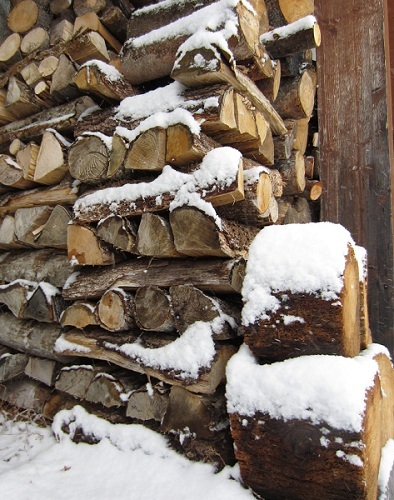 and seeing those logs of wood makes me longing to build a fire!! Your cheese dish really hit the spot today as I went on a binge yesterday at the cheese monger’s and blew my self-imposed market spending allowance on a soft goat cheese, gruyere, provolone, cranberry Wensleydale and a chunk of Huntsman’s. A little crazy for a single person. Today’s cheese is Beaufort, a good hard mountain cheese. This is definitely snow food with its cheese, cream and wine! I love your hexagonal gratin dish. Thanks 🙂 The serving dish, was one that was here, and to be honest looks like it will get used at every mealtime for the next 4 months !